Millions of our aging senior population will fall prey to scams, fraud, and identity theft every year. 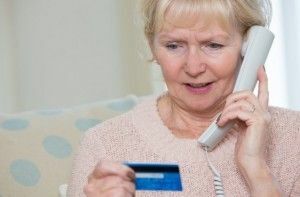 Because the older adults are more trusting of people who they don’t know and often are open to chatting with others, they are more vulnerable to these types of scams. Some seniors may also have cognitive issues that affect their judgment and reason. In addition, as seniors become less mobile and physically strong, they invite in more personal services and assistance into their lives and homes. All of these factors can leave them susceptible to fraud or a stolen identity. Help protect them from becoming a victim with these tips. Do not allow anyone but a trusted family member, friend, or professional financial adviser to handle your finances or banking. Never give out your pin number, social security number, bank account, Medicare, or credit card over the phone, unless you have initiated contact and know the company that you are speaking to. Never send this information via email. Do not toss in the trash any documentation that includes this type of information, but shred it. Get recommendations from friends or family for reputable help or services, who may be entering your home. If you need an in-home care provider, work with an established agency or request references and get a background check if you are personally hiring someone. Be careful of door-to-door sales. Most reputable companies no longer use this practice. Be cautious of high-pressure sales pitches with too much urgency. Never sign a contract without understanding clearly the terms of the agreement. Notifications by phone or email that you have won a trip, prize or money are typically a hoax, unless you have specifically entered yourself. Contact made in this way should be a red flag. Do not assume that all charity organizations are legitimate. Research a charity before making a donation. Do not make a large financial purchase or investment without consulting an independent, trusted loved one or financial adviser. Sign up for identity theft protection to monitor personal and financial information. If there is an issue, this type of protection can provide aid and assistance to an individual. If you are scammed or are concerned that you might be the victim of a scam, don’t be afraid to talk about it. Seek help because waiting could have huge financial consequences. At Aegis Living we strive to protect vulnerable seniors and hope this information will help prevent your loved one from being scammed.